Napowrimo, Day 24 and the prompt is to write a poem of ekphrasis — that is, a poem inspired by a work of art. But I’d also like to challenge you to base your poem on a very particular kind of art – the marginalia of medieval manuscripts. 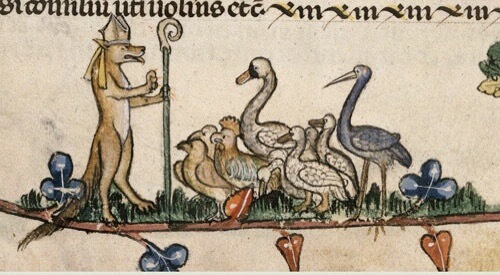 Here you’ll find some characteristic images of rabbits hunting wolves, people sitting on nests of eggs, dogs studiously reading books, and birds wearing snail shells. What can I say? It must have gotten quite boring copying out manuscripts all day, so the monks made their own fun.